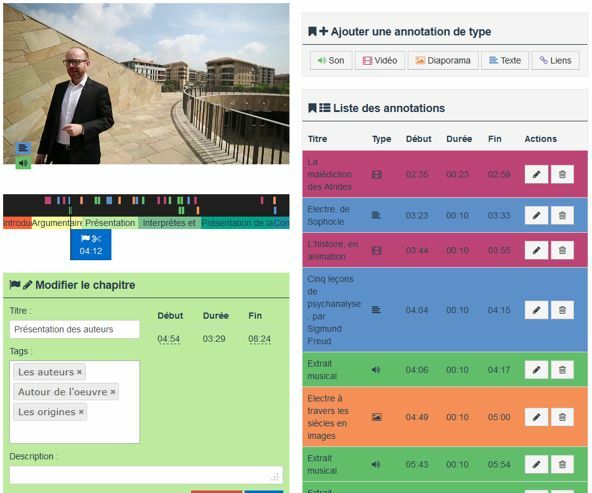 In line with the Ligne de Temps platform, the MD-composer was created as part of the partnership with the Aix en Provence Lyric Art Festival. It enriches a video with multimedia content (text, image, audio, video, links) and publishes it in an editorial environment. Based on the Cinélab data model and the Lignes de Temps technology, the device articulates an editing backoffice and an increased player for the user. This allows publishers to enrich existing content at any time by adding additional content. A contributive version is being developed where users can annotate, comment on specific parts of the video, and possibly add additional content themselves. 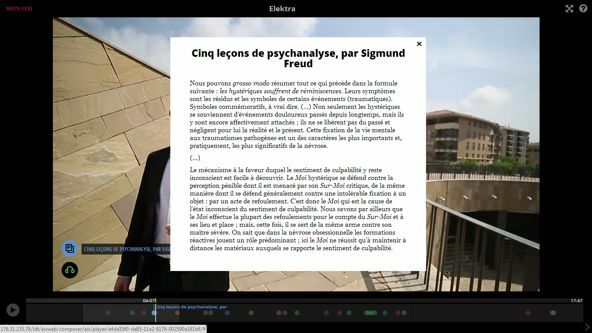 Two Aix Festival productions have used the MD-Composer backoffice to produce two clickable documentaries, dedicated to Rigoletto and Elektra, works on display at the 2013 Festival d’Aix.